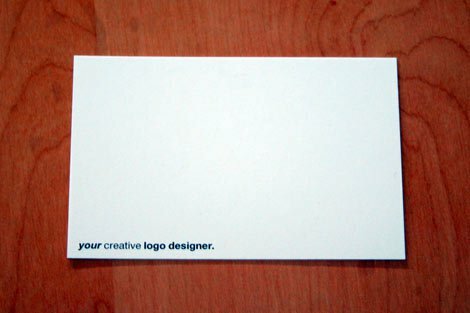 A few weeks ago there was in interesting post doing the rounds on minimal style business cards. 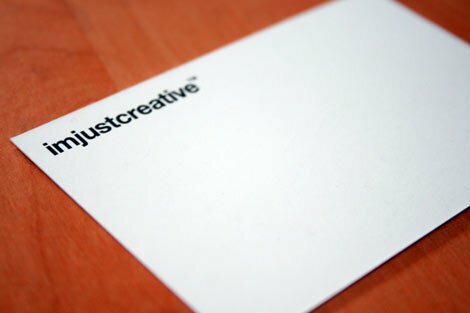 The motivation was to create mostly blank cards with maybe a logo or one specific useful bit of printed information; leaving the giver to jot a custom note or allowing the recipient to do it themselves. 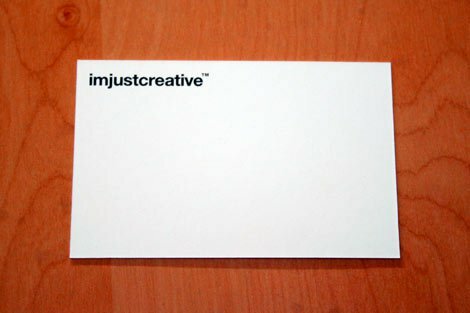 I found this to be a really interesting take on business cards as it allowed for a more personal and unique touch to what can be a rather steril and generic action, and so I decided to create some myself. 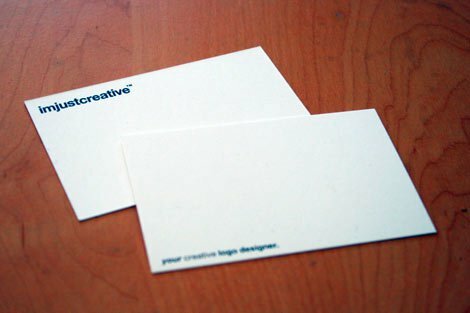 They are not business cards in the general sense, I would say they are more of a business note card. The first thing was to decided on the level of information to be printed, so I opted for a double sided option: full logo on top front left and then my tag line on the bottom left reverse leaving ample blank space for notes and scribbles. I then looked at how one could get this information onto the card and considered regular litho or digital printing, creating an even more minimal look by just having a Spot-UV of the logo, and the last option was a deboss or letterpress. As this was more a trial run I opted for the quick and easy option of printing just black, and saving the more costly versions if the trial was successful. 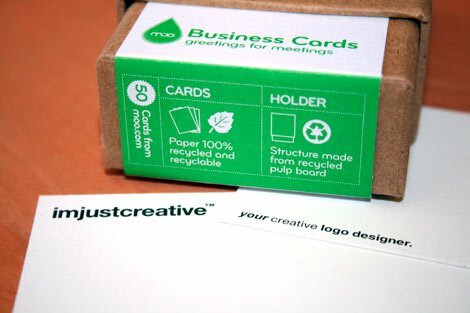 Moo.com was the obvious choice for hassle free and cost effective printing so the only other decision was the card type to use. I usually use their coated stock which is really nice and relatively firm at 350gsm, but the coated card can be tricky to write on with Biro or pencil. 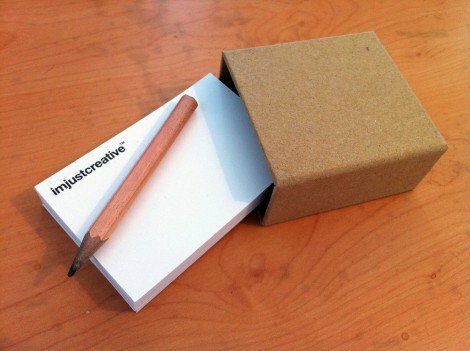 To allow easy scribbling with any kind of pen or pencil opting for the uncoated and 100% recycled card option makes perfect sense. The uncoated cards actually has a heavier tactile feel to it than the coated card in my opinion. The cards took just over a week to arrive and I am really pleased with the overall look and feel of these minimal style logo cards. When you add them to the Moo card holder, which fans out, you get a nice spacious view of the cards and logo. As there are three levels to the card holder I reversed the card on the bottom level so that the tag line is also viewable on presentation, as you can see below. 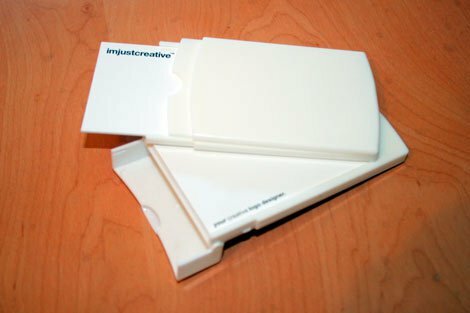 If you are bored with full contact business cards then it is well worth considering this option as a supplement or replacement. Being a logo designer the concept works nicely as they really are just my logo cards, and the message could not be clearer. 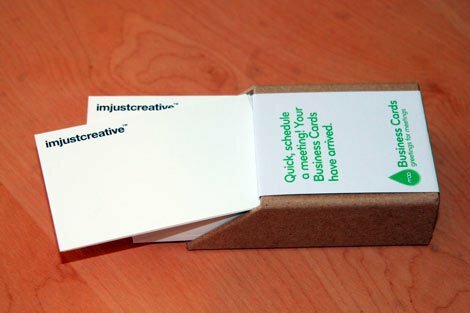 Cost £28: 50 double sided cards on uncoated 100% recycled stock plus white Moo card holder including P&P and VAT. The only proviso here is that you always carry a pen or pencil but as I rarely go anywhere without my notebook and writing stuff this is not a concern. Proud to have these cards featured in a blog post on the Moo.com blog.